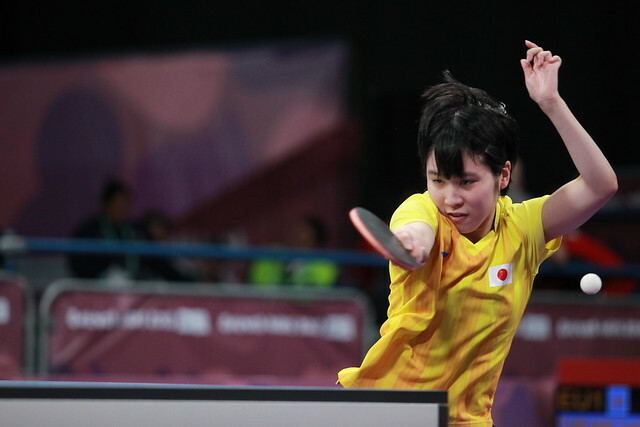 One day earlier in the Women’s Singles event at the Buenos Aires 2018 Youth Olympic Games, it was disappointment for Romania’s Andreea Dragoman, delight for Azerbaijan’s Ning Jing; one day later on the evening of Tuesday 9th October it was the reverse scenario. Andreea Dragoman booked her place in the semi-finals, Ning Jing bid farewell. On the second day of play in the concluding group stage contest, Ning Jing, the no.18 seed, had beaten Andreea Dragoman, the no.13 seed in six games (7-11, 11-9, 9-11, 11-9, 11-5, 11-3) to secure second place in the group behind the Romanian and thus progressed to the main draw. One day later, at the quarter-final stage of proceedings, Andreea Dragoman caused somewhat of an upset. She overcame Amy Wang of the United States, the no.9 seed (11-9, 8-11, 11-9, 6-11, 11-5, 12-10); conversely, Ning Jing experienced defeat at the hands of India’s Archana Girish Kamath, the no.18 seed (13-11, 8-11, 6-11, 11-3, 6-11, 12-10, 11-7). A most creditable performance from Archana Girish Kamath; the ranking of Ning Jing somewhat belies her ability; notably she has won the Junior Girls’ Singles title at the two most recent European Youth Championships and on the third day of play in Buenos Aires she was in form. Earlier she had ousted Puerto Rico’s Adriana Diaz, the no.4 seed in five games (7-11, 11-5, 11-6, 11-4, 11-8). “It was a very tough match and she fought till the very end, so I’m very happy that I could win but she played really well. I’m really excited for the semi-finals tomorrow.“ Archana Girish Kamath. Success for Andrea Dragoman and Archana Girish Kamath; there was also success for the most prominent names. Japan’s Miu Hirano, the top seed, accounted for Russia’s Mariia Tailakova, the no.14 seed (11-2, 11-7, 11-7, 11-3). Impressive from Miu Hirano, it was the same from China’s Sun Yingsha, the no.2 seed, ended the hopes of Brazil’s Bruna Takahashi, the no.7 seed (11-8, 11-5, 12-10, 11-5). The semi-finals and final of the Women’s Singles event will be played on Wednesday 10th October.